How much do we know about Hatshepsut? She was the daughter of Thutmosis I and Queen Ahmose. Did she have 2 brothers who were in the army and died before Thutmosis I did? What is known about her sister Neferubity? She died young I think. Did she ever play an official role at all? She had a daughter Neferure. I have heard conflicting reports. Did she survive into adulthood and have children of her own or not? I think this is a nice bust of Maatkare. Nefertiti, I'm also having problems. I posted one earlier, but now only the url comes up. I do like the image you sent too. The Idea is to go to "view image" on the web. This is the address you want to enter. Sorry to those who are more tech savvy than me. Nefertiti, I've editted your post so the image works now. All image links should start with the http:// part, not just the www. and some websites prevent 'hot linking' if you try and link to them directly. The best solution is to preview your post before posting the message to see if the image shows. Hatshepsut, the female pharaoh, attempts made after her reign to try and erase her from history by destroying any references to her that were written throughout the land of Egypt, this attempt possibly being made by her successor Tuthmosis III. It's been a while since I have read up on her so exact details are not very close in mind. Try reading Hatshepsut by Joyce Tyldesley. Thanks for the feedback. That definitely helps. I read somewhere that Thutmosis III didn't start eradicating Hatshepsut's image until quite a bit later in his reign. I wonder if he only got around to it later, or if there were maybe others he perceved as a threat. Going after Hatshepsut might have sent a message to other wannabe usurpers. Sitamen II has been though by others to be the daughter of Amenhotep III by Queen Tiye, but there are some questions about that because of daughters being depicted in temples, and Sitamen not being among them when she should have been present. I can't believe Serena hasn't posted here yet. As Hatshepsut (or at least Hatshepsu) is her board name I thought she would have jumped at this thread. Earth calling Serena, where are you? lol thanks.. right now i have to go.. i will post soon.. wekkened probably.. i cant really comment fully on it.. i think itd be awesome if Sitamun ( not checking spelling) was a direct discendent.. because hell i liked her! Has the mummy of Hatshepsut been found? A royal mummy was found in the tomb of Sitre-In, the wet-nurse of Hatshepsut. it was found to have been quite fat in life, her original hair, which had fallen off over time, was found underneath where her head lay. The most interesting point about this mummy is the positioning of the arms - the right arm was crossed over the breast which suggests royalty, Elizabeth Thomas has used this arm positioning (and the fact of the mummy being found in the tomb of Sitre In) as evidence that the mummy is that of Hatshepsut herself (her mummy could have been hidden here after her death to escape the vengenance of Tuthmosis III). There are some other possibilities: a mummy in the cache of mummies in TT 320, or the elder lady from Amenhotep II's tomb. But I think the elder lady is generally accepted to be Queen Tiye. before we assume these things.. that it was her.. id like a little more information on this.. who thinks this and why.. the age of the mummy plays a significant role since hatshepsut had sisters.. probably cared by this same nurse.. why she would end up with the nurse is beyond me.. there are more suitable places shed be buried.. i just took out two books on her.. i will comment more later when ive gone through them.. i know Hatshepsuts basic life.. iw ish to know more. It's only one of a couple of theories. 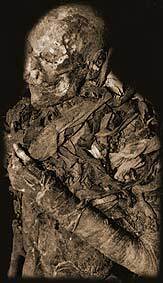 Quite a few mummies were removed from their original resting places. I don't think that they believe she was originally buried with her wetnurse. There were 2 tombs: KV21 and KV60 that contained the remains of royal women. The mummy of Sitre (called In) was removed, but from what I have read, the other 3 are still interred in these tombs. I think that Neferubity, Hat's sister, died too young to be the mummy shown above. Ahmose-Tumerisy, Hatshepsut's mother. She was shown in reliefs dating to the reign of Tutmosis II, her step-son / son-in-law. So she might fit the bill. And there's always the possibility that she was someone else entirely. And the ladies I mentioned for are unaccounted for, right? Or have they found some of these other women? Elizabeth Thomas (1907-1986) was an American Egyptologist who suggested that the mummy in KV60 might be Hatshepsut. The tomb was relocated by Donald Ryan from Pacific Lutheran University, and the tomb was re-excavated during the 1989-1990 season. All of this according to the information on the theban mapping project website, associated with Kent Weeks.